Obamacare opponents plan to advertise in New York City's Times Square. Obamacare opponents are taking over Times Square. The Heritage Foundation this week is unveiling a six-story billboard on New York City's 42nd Street that says "Warning: Obamacare may be hazardous to your health." The posting comes as the Obama administration is ramping up its marketing push to spur enrollment in state-based insurance exchanges, a cornerstone of the Affordable Care Act, known as Obamacare. Enrollment begins Oct. 1, with coverage kicking in in January. Heritage, a right-leaning research organization, said that its nine-city "Stop Obamacare" tour attracted packed houses, so it decided to take the next step. 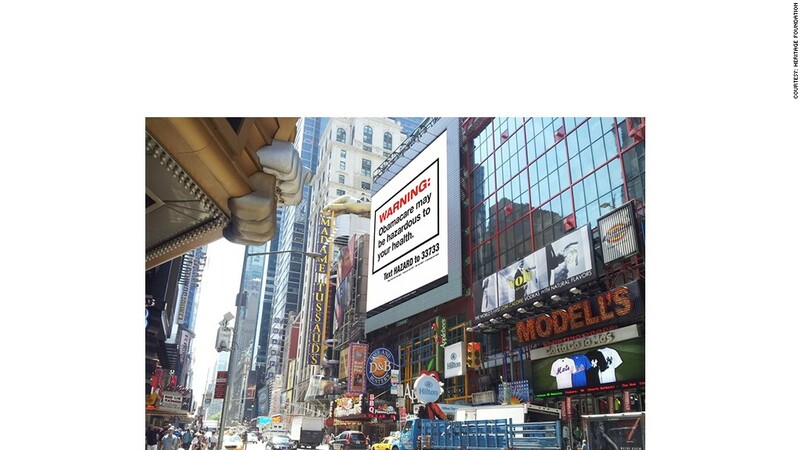 The billboard will encourage viewers to get more information on Obamacare by texting the word "Hazard" to 33733. "We thought it was time to move to a bigger stage and bring the message to a wider audience," said Jim DeMint, foundation president and former Republican senator from South Carolina. DeMint also wrote an op-ed on FoxNews.com Tuesday that says that under Obamacare, many Americans will lose their current health coverage and access to their doctors. It will also increase the Medicaid rolls by millions. The billboard is one effort that opponents are undertaking as the opening of enrollment begins. The Tea Party Patriots were scheduled to hold a rally outside the U.S. Capitol Tuesday to voice their opposition to health reform. Scheduled speakers include Republican Senators Ted Cruz and Rand Paul.